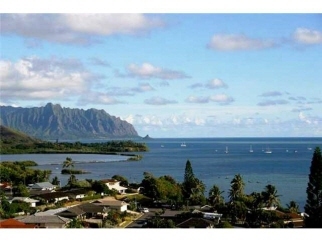 Amazing views of Kaneohe Bay and Koolau Mountains. Two bedroom, two full bath townhouse with single car garage and additional driveway parking. Split A/C, hardwood floors, remodeled baths. Direct access to kitchen from garage area with no outside stairs. This is the only 2 bedroom Bamboo model with fabulous K-Bay views on the market in Phase I of Puu Alii.